Many thanks to all who attended the Mountain Top Historical Society Open House. Below, please find some pictures of my pieces. Please feel free to e-mail me at tina.accardi@gmail.com should you have any questions! 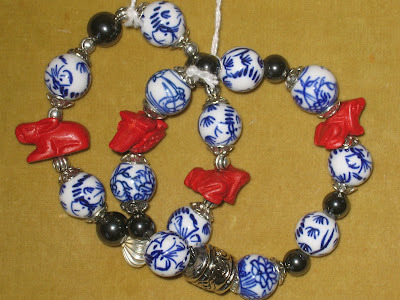 Made with faux cinnnabar, chinese porcelain beads, hematite and pewter charm beads, these bracelets are great for layering with a beautiful color contrast. 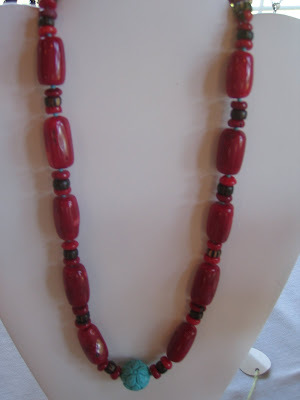 The combined texture of chunky red coral with petite turquoise seed beads, wood and floral carved turquoise focal bead can stand alone as the centerpiece for the simplest of outfits. 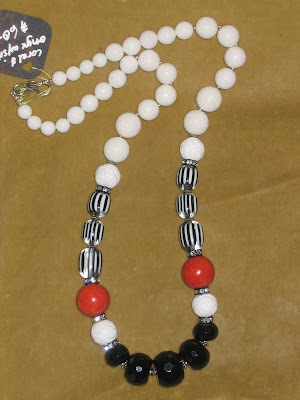 This long styled necklace combines graduated white coral beads with striped vintage beads, red coral , and chunks of faceted onyx for a fun and also elegant piece.